Arsene Wenger lined up his Arsenal team in his preferred 4-2-3-1 formation with a makeshift back-line of Ainsley Maitland-Niles at right-back, with Shkodran Mustafi and Rob Holding at centre-back and Sead Kolasinac at left-back. A midfield of Granit Xhaka, Mohamed Elneny and Mesut Ozil supplied the front-line of Henrikh Mkhitaryan, Alex Iwobi and Pierre Aubameyang. New Watford manager Javi Gracia has had a good start in his first games in charge and has shown that he’s tactically flexible. He changed the system from the team that beat West Brom – switching from a 4-2-3-1 to a 4-4-2 formation with Roberto Pereyra moved to left-wing with Richarlison partnering Troy Deeney up front. Ever impressive Abdoulaye Doucoure partnered Etienne Capoue in the middle of the park. I’m a huge Richarlison fan but it’s obvious to see that he needs a break. He played pretty much every minute under Marco Silva and hasn’t had a break for a long period of time (due to the Brazilian league playing over the summer when he joined Watford). He was deployed alongside Deeney up front with Gracia possibly hoping that moving him closer to goal could potentially help end his goal-scoring drought – he hasn’t scored since scoring against West Ham on the 19th November but again he showed that he’s still very raw which may pose some red flags to any potential suitors. He took the most shots for Watford (4) but only 2 were on target. His decision making was poor, shooting at times he should’ve held onto the ball and holding onto the ball when he should’ve shot that lead to him losing the ball more than any other Watford player (5). One particular example was this delightful ball over the top of the Arsenal defence by Pereyra, Richarlison times his run beautifully to get in behind, before hesitating on taking a touch letting the ball bounce up perfectly for a first time shot but again he hesitates – allowing Xhaka to get goal-side and nullify the danger. Looking at the Watford’s back-line, one thing is obviously apparent – the lack of pace would likely cause problems if Aubameyang, Iwobi or Mkhitaryan were to get in behind the back-line. Watford lined up with a centre-back pairing of Adrian Mariappa (who whilst no slouch, is certainly not quick) and Sebastian Prodl (who at 6ft 4in reminds me of Per Mertesacker in the way he runs, he’s gangly and very slow) – and it was obvious that Wenger’s game-plan was to target them with through-balls for Aubameyang to latch on to. This was demonstrated in the opening 2 minutes of the match when Ozil played a beautiful through ball to Aubameyang who annihilates Prodl for pace, forcing a fine save from Orestis Karnezis. This was the case time and time again as Arsenal gambled on Aubameyang beating the Watford defence on pace, which was finally rewarded with a goal as Aubameyang managed to breach the Watford offside trap before rounding Karnezis. Watford did not help themselves in this regard, by playing a central midfield pairing of Capoue and Doucoure, who found themselves outnumbered and subsequently were bypassed too quickly and easily by the Arsenal midfield trio at every opportunity that also hindered Watford’s chances of getting back into the game. Here we see Prodl bringing the ball out the back but with Doucoure pushing too high up the pitch and Capoue in no-mans land there’s a distinct lack of passing options until Kiko Femenia drops back to receive the ball. Again though he has no decent option to move the ball forward and has to pass back to the defence – ending in a long-ball that’s easily dealt with. 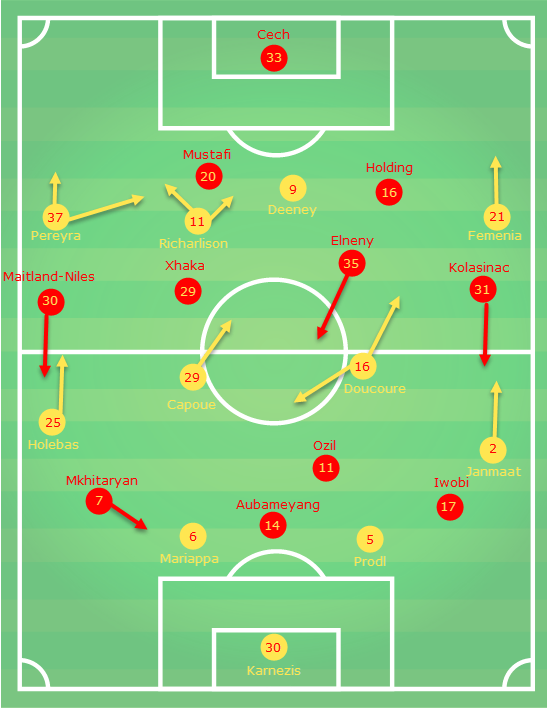 Arsenal looked most dangerous on the counter-attack when Watford’s central midfield had to push up the pitch to support the wingers and strikers. When Arsenal had an extended period of possession Watford looked a lot better. Here we see Femenia (1) drop all the way back to cover Iwobi whilst Janmaat (2) shuffles across with the rest of the Watford back-line. Just 2 seconds later, this was the picture. Pereyra has dropped back to help Holebas with Capoue and Doucoure limiting any passing options on the edge of the box with Mariappa tight to Mkhitaryan. Watford were happy to let Arsenal have the ball in these areas and focused on keeping their shape and trying to restrict the space for Arsenal to get in behind as demonstrated in the clip below. I think a 3-0 victory flattered Arsenal somewhat, but it has given a much-needed confidence boost to Wenger and his players. Watford will be somewhat disappointed to have conceded so early on in the match – particularly from a set-piece (Mustafi headed home the opener after just 8 minutes), and I feel that Gracia should have made a tactical change earlier than he did – Will Hughes has been fantastic for Watford so far (when he hasn’t been injured) and the game was calling for his presence much earlier than his introduction in the 62nd minute. I feel Watford’s best chance for a result was matching Arsenals 4-2-3-1 with Hughes in the number 10 role, with Pereyra or Andre Carrillo out the wing and Richarlison given a rest for some big games to come.